Commodore's CDTV, with a built-in CD-ROM drive, was an early attempt, but the underlying original Amiga hardware wouldn't benefit too much from a CD drive, and there was simply not much experience in how to make good use of the CD's extra capabilities. But after the PC and Apple Macintosh market had established the technology and created a demand for added content, it became a must for the Amiga, too. The only Amiga model to make full use of CD-technology is the CD32 console, booting from CD without any additional setup, playing back full motion video and integrating the Amiga's audio with the CD's 16-bit audio tracks. Wait. The only Amiga model? No. In fact there was another Amiga model that could do the same things, of which nine units were built, and only one is known to still exist today. It's probably the rarest of all (near) market-ready Commodore Amiga developments. It's the legend, the one that should have boosted sales to new heights, potentially saving Commodore from bankruptcy. It's the Commodore Amiga CD1200. Just to avoid confusion, we're talking about the "Commodore Amiga CD1200" - not the "Commodore CD 1200 Controller" for the CDTV, or the "Alfa Data CD1200" PCMCIA controller for the Amiga 1200. 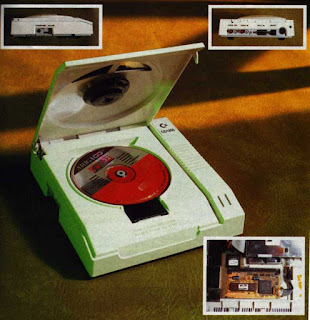 It's a CD-ROM drive to be connected to an Amiga 1200, and with a little extra. It has a custom "Data Input" connector, that connects to an expansion board in the Amiga 1200's internal expansion port via cabling routed through the Amiga 1200's backside blanking plate. It also routes Amiga audio signals through, merging them with CD-audio. The expansion board adds a FastRAM SIMM slot, and - in a proposed later model - would have had another custom chip, and room for a 68030 CPU upgrade. The CD1200 was presented to the public at the CeBIT 1994 show in Han(n)over, Germany. It's goal was to unite and boost Amiga CD32 and Amiga 1200 hardware and software sales, by being compatible with the former, and adding a CD drive to the latter. Now what makes the CD1200 such a rare piece? Well, first of all, according to Beth Richard, lead engineer on the project, only nine prototype units were built. Eight of them got lost in the turmoil of Commodore's bankruptcy, and only one unit resurfaced. And even that one wasn't instantly recognized as the rarity it is. Would the CD1200 have been able to save Commodore? Well, maybe. In 1994 Sony scored a huge hit with it's Playstation console, which has a CD drive, but also offers hardware 3D acceleration and 16-bit 24-channel sound. A CD-drive had become a must-have, but chipset development and platform architecture had also been moving forward rapidly. A CD32, or CD1200-equipped Amiga 1200, wouldn't have been able to compete with PC and console development for a long time, but maybe CD1200 sales, and now-CD32-compatible Amiga 1200 hardware and software sales would've bought Commodore enough time to release the next generation of CD1200 with CPU upgrade, and so on. But it's just speculation. For Amiga 1200 users it would have been a fantastic addition, with a 68030 CPU on board, especially due to the beautiful design that matches the Amiga 1200 one's. And Amiga CD32 owners would certainly envy the added horsepower, memory, keyboard and i/o-ports. From todays point of view it would of course just be great to have such a device, in whatever condition or configuration, because it's sooo Commodore Amiga. The fact that there's presumably only this particular one in existence, a rare piece from the last days of Commodore, makes it pretty much the collector's item par excellence. Time will show if maybe another CD1200 exists - maybe it resurfaces due to the raised interest created by discovering and exposing this one. Until then, all we can do is visit the Retro Computer Museum Leicester and feast our eyes on the one that's there. All we can do? Amigans weren't Amigans if they weren't willing to do something about that. Yes, there is some minor activity going on: A facebook group is dedicated to resurrecting the CD1200. In the video by The Centre for Computing History (see above), Andy Spencer says he'd like to open up his CD1200 one day, and maybe, together with the pictures published in magazines, and knowhow from people involved with the project, this will give the insight required to recreate the CD1200 and it's expansion board. Do you have more information about the Commodore Amiga CD1200? Did you spot a mistake in the above article? Please leave a comment!